Yesterday I had coffee with my immensely good-natured friend, the writer Renee Mihulka, to discuss the first ten pages of our middle grade fiction books. We are both attending the KIDLIT festival in May at the Victorian state library, and have elected to submit the first ten pages of our books to a publisher for some feedback. We’ll receive written feedback in a fifteen minute session. Gold! So, naturally, our ten pages have to be the most sparkling, eloquent, page-turning, engaging, meaningful, action-packed pages of our manuscript. And as publishers, editors and agents usually request the first section of a manuscript, it makes sense to work on our first ten pages. But do you know what the first ten pages of a book must do? Let me tell you – you will never think lightly of a first chapter again! have a killer opening sentence to hook readers – It was the best of times, it was the worst of times from Charles Dickens. 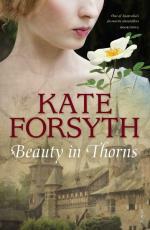 Or perhaps – Ava fell in love the night the Nazis first showed their true faces to the world (‘The beast’s garden’ by Kate Forsyth. Or how about – I don’t know how I died (‘In the quiet’ by Eliza Henry Jones. Or – On the day of the miracle, Isabel was kneeling at the cliff’s edge, tending the small, newly made driftwood cross (‘The light between oceans’ by M. L. Stedman). Hooked by Les Edgerton and Writing the heart of your story by C.S. Lakin contain lots of relevant, helpful information to help writers begin well. Renee and I dissected each other’s work, cutting the dross, ticking our checklists, questioning every word and whether it had earned its place in the first ten pages. Renee pointed out that I like to say the same thing, in the same paragraph, in three slightly different ways. (But I have to make sure my readers really understand my point! I mean, they have to understand it! Let me check they’ve really understood it!) I tried to argue my way into keeping one fragment of a sentence because I wrote it with Mr 13 in mind. But my readers won’t care about Mr 13, and the fragment wasn’t consistent with how my protagonist speaks. Deleted – you were right, Renee. I have been flicking through my books, both adult and children’s, rereading the first chapter. I loved The light between oceans, The beast’s garden, When you reach me by Rebecca Stead. It’s hard to stop immersing myself in the story and be analytical instead, but when I realise I’ve escaped into a story, that’s when I know I need to analyse it because it’s that good. Which books have you read which had you hooked at the first chapter? I’d be grateful for some more books to add to my research pile. My current definition of intense – spending a day with Kate Forsyth while she teaches the finer points of plotting a novel. I flew to Sydney (blue skies, warm weather, gorgeous friends) for the weekend to do a writing course at the Australian Writers’ Centre. Kate was equal parts inspiration and practicality – I finished the day feeling like I had new tools for my writing and was inspired to try this new way of planning a novel. I have completed many writing courses over the past five years but never one on planning or plotting a novel before. I have always been a got-a-vague-idea-let’s-see-where-this-goes kind of writer. And it never felt quite right but when I did try to plan out a novel I became stuck, and would just write it out, rather than plan it out. And I wondered whether I was really procrastinating by writing lists and moving scenes around … surely that wasn’t moving my story forward? It also seemed at odds with the way I usually organise myself in life – I am a write a list kind of girl – for groceries, daily tasks, Christmas presents, etc. I read a fantastic book on planning a book – C.S. Lakin’s The twelve key pillars of novel construction but it has taken Kate’s workshop to really understand the benefits of planning. For a little while, I have been wondering about the connection for writers between the left and right sides of the brain, the analytical and the intuitive sides. When Kate defined the four stages of writing as daydreaming, plotting, writing and editing, I could see that both sides of the brain are equally important for writing. Obviously, you need intuition for daydreaming, and analysis for plotting and editing. I would have thought that writing relies more on intuition but Kate said that analysis is just as important because you need to make decisions on what you are writing. that if you are stuck, it means you don’t know enough about your characters or your story. Kate gave us a ten point detailed explanation of her process for planning a book. I am going to use this on the first draft of my NaNoWriMo book – even though I have already written the first draft. There are only three weeks until the Easter school holidays but I want to apply Kate’s process in reverse before I start the second draft. And Kate did tell us that it was ok to change your plan and that she did so frequently! So I’m making up my mind to be an organised, planned writer, just like I am organised and planned (somewhat!) in the rest of my life. Are you a planning sort of person for most of your life’s details or just some of them? And if you are a creative type, with a flair for cooking or sketching or sewing or writing, are you organised or a free spirit with your art? It may seem as if I’m justifying my time here – but I worked really hard in February! I worked on the last draft of the first children’s book in my series this month. I’m nearly ready to send it off by the end of the week to a publisher’s competition. I feel as if I have another daughter, twelve-year-old Freya, the protagonist of my story. I am spending so much time in her head at the moment. I am always asking – what would Freya do here? Would Freya be friends with that girl? How would Freya walk if she were sad? What is the first thing Freya would do when she came home from school? I’ll probably be setting a plate and cutlery for her at the table tonight! I also entered a short story into a competition, and I have an idea for another short story. I don’t want to spend too much time on it but it is haunting me, so I need to put some of it down on paper. I’m going to a writing workshop in Sydney next weekend. The presenter is Kate Forsythe, author of so many wonderful books I can only type in a few – Wild girl, The beast’s garden, Bitter greens and many, many books for children. The workshop is about plotting and planning a novel. Authors are usually either a plotter (plans everything first, then writes) or a pantser (writes by the seat of their pants, has a rough idea and starts writing). Allison Tait and Valerie Khoo, who host the Australian Writers’ Centre podcast ‘So you want to be a writer?’, usually ask their guest authors whether they are a plotter or pantser. So interesting to hear the many and varied ways authors write their books. Of course, it is a sliding scale, and I sit closer to the pantser side. I start with a bit of a plan and write from there but I am someone who needs to write many, many drafts. I’m hoping to try out Kate’s detailed planning with my next novel, to see if it cuts down on the number of drafts. I am a pretty organised sort of person for my non-writing life, so I want to carry that across into my writing – that seems logical, doesn’t it? It’s worth a shot anyway – maybe I’ll convert to the planning style of writing or I might come back from Sydney feeling too constrained by all the details and go back to my old pantser ways. And I also want to redraft the second book of my children’s series, which I wrote in November for NaNoWriMo. It has been sitting patiently on my computer, waiting for me to see it with fresh eyes. Second drafts are fabulous, because I know that the first draft is so terrible that anything I do to it will improve it enormously! And because it’s still big picture stage, there’s no pressure to make it perfect. So I’m looking forward to seeing the world through my twelve-year-old street artist’s eyes. Thank you so much to everyone who reads my posts and comments. I love having conversations about books online – and in ‘real’ life. I would be grateful if you would forward on my posts to your bookclub group, or friends/family who like reading, or want to find some great books for their kids. Thank you! There’s something special about buying a book series, about seeing all the matching spines lined up together on your bookshelf. Lots of kids are collectors, so collecting, let alone reading, the whole set of books can feel like a mighty achievement. I’ve listed some of my favourite kids’ book series, for kids aged six to twelve. Later in the week, I’ll post my favourite stand-alone titles for kids. I hope this helps you with your Christmas shopping! Some of my favourite bookshops – where the staff are knowledgeable and helpful – include Readings, Tim’s Bookshop and The Little Bookroom. 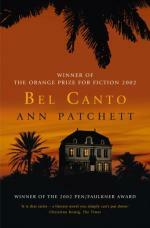 I also buy books online from Booktopia, an Australian online store, as well as Readings. You can order in-stock books from Booktopia and Readings in time for a Christmas delivery by Friday 11 December. Of course, these bookshops will also have their own bestseller lists which can be a great starting point for your Christmas shopping. The Ranger’s Apprentice by John Flanagan – there are 12 books in this series – that’s reading gold for an obsessive reader! Here’s my review from a month ago. We gave them to Mr 11 for his 11th birthday, and he devoured them. Miss 9 is reading the second one now. Last week, she and Mr 6 dressed up as Rangers with cloaks and tied string around some sticks to make bows. I would suggest that they are more for boys than girls, but the second book brings in a couple of strong female characters so I think they would be fabulous for girls as well. I’m glad Miss 9 is reading widely about wonderful male characters. There is lots of action, so reluctant readers would be enticed. Obsessive readers would love the thrill of reading the whole series. Great for 9-12 year-olds. Truly Tan by Jen Storer – so far there are five books in this series. I spoke with Jen Storer at a bookshop a couple of weeks ago and she told us that there is another book coming out in May 2016. Tan is a detective type of girl, who writes in a diary and likes to write definitions. Great for 8-11 year-olds, maybe bookish seven-year-olds would love them, too. 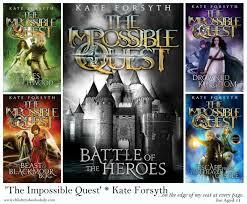 Impossible Quest by Kate Forsythe – there are five books – you can buy them separately or in a beautiful slipcase. Such a wonderful fantasy quest theme. Great for girls and boys as there are four child protagonists – two girls and two boys. Mr 11 and Miss 9 have read them – great for 9-12 year-olds. 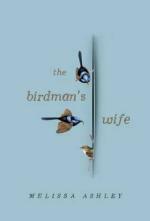 Kate Forsythe is an amazing story-teller – her adult and children’s books are all page-turners. 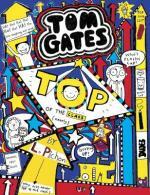 Tom Gates by L. Pichon – these are similar to the Wimpy Kids books as they have cartoon illustrations with a graffiti bent. Mr 11 devoured these at age nine, and the illustrations really influenced his drawing style for a few years. Great for reluctant and obsessive readers alike. Probably more for boys than girls. There are ten books. Great for 8-11 year-olds. Princess Betony by Pamela Freeman – these books look beautiful. They have that special keepsake quality about them – gorgeous covers, ribbon bookmark, dust jacket, petite size. There are three books about Princess Betony, the daughter of a king and a dryad. Princess Betony, a pants-wearing sort of princess, has been accepted as part of the Wild Magic, and many adventures follow. The stories are lovely, and I suspect reluctant readers would be tempted to try hard to read these gorgeous-looking books while obsessive readers would appreciate the well-developed characters and interesting storylines. Great for girls aged 7-10. Younger girls may appreciate these books being read to them. While I would never discourage readers of any gender to avoid a particular book, I must admit, these books really are for girls. The Kingdom of Silk by Glenda Millard – this series is filled with the most beautiful family you could ever imagine. I wish I had read this as a kid – it would have filled me up with creativity and magic and gentleness. It is such a gentle and quiet series, with many beautiful life celebrations and sad moments. There is death and aging and weddings and finding love and making cakes and singing songs and painting and ignoring school rules and finding creative solutions and illnesses and friendships – the gamut of life. Miss 9 read nearly all of these books when she was eight. I might start reading them to Mr 6 over the holidays – he may/may not be quite ready for them. Each book is quite slim, so it would be a nice challenge for a reluctant reader to tackle. This would be a beautiful experience to read these books with your kids. Great for boys and girls, maybe leaning more towards girls because the books are so soft and gentle. Not that boys shouldn’t read soft and gentle books! Great for 7-10 year-olds. The Mapmaker Chronicles by A.L Tait – I’ve blogged about this fabulous series here when I interviewed the author. Enough said. Adventure, fast pace, page-turning. This series includes more boys, but there is a strong girl character. Great for boys and girls, leaning towards boys. Great for 9-12 year-olds. Sporty kids by Felice Arena – there are currently six books out in this new series. A bookseller recommended this to me for Mr 6, who sometimes thinks that he is too big to read picture books and wants to read chapter books to keep up with his older siblings. Each book can be read independently, so there is no particular order. Each book has four chapters, pictures and a large font. Mr 6 can almost read them by himself. This type of book is a winner – your child can enjoy you reading them to him, but will also be capable of reading them himself a little way down the track. There’s a great mix of genders across different types of sport. This series would work well for advanced 4-5 year-old readers and would equally work well for reluctant readers, aged 6-7. Great for girls and boys, great for 6-8 year-olds. Violet Mackerel by Anna Bradford – another gorgeous series with beautiful hardback covers. Violet is a thoughtful, creative girl who deals with her mother’s wedding, making friends at a hospital and many other small and large adventures. Heart-warming, gentle stories. There is also a Violet Mackerel craft book. Miss 9 and I have made a few things from it. This series is definitely for girls, especially lovely for crafty, creative girls, great for 7-10 year-olds. The Keepers by Lian Tanner – I haven’t read this trilogy but Mr 11 has and recommended it. He read it about two years ago. The back cover of the first book describes the series as ‘a thrilling tale of action and adventure’, and the website looks fabulous with lots of information and quizzes. Great for girls and boys, ages 9-12. I hope this gives you a few ideas for Christmas! Let me know in the comments if you decide to buy any of these suggestions for Christmas or if you can recommend other children’s series. Next post will offer stand-alone book ideas, and then I’ll write a post for adult fiction suggestions. Happy shopping!